On Saturday, I made the 50 minute drive from Kanchanaburi to Elephants World, a nonprofit rescue facility for 20 elephants. The elephants came to the facility in different ways and for different reasons but a lot of the older elephants were used for logging at one time. When the Thai government outlawed logging in 1989, thousands of elephants were without work. Many ended up begging with their mahouts (human partners) on city streets or hauling heavy loads for trekking companies or entertainment. Elephant backs are not strong enough to carry more than about 100 pounds so trekking and riding people around on sedans creates serious health problems for them. And elephants are very sensitive to vibrations and sounds, so city life is especially stressful for them. Elephants World is a sort of retirement home, which means you work for the elephants, not the other way around. We started our day by hand feeding each elephant about 40 pounds of watermelon and bananas. Elephants eat up to 500 pounds of food every day so the fruit was really just a morning snack. I fed Rom Sai, an older bull who ate politely and slowly while the babies next to him were shoveling it in and trying to sneak extras. After snacks, we went to elephant cooking school. The older elephants can’t eat enough to keep the weight on because of their aging teeth and eyesight. So they get daily high carb supplements of sticky rice with special vitamins. The elephants roam free over the whole property so while we were cooking 50 pounds of rice over open fire pits, three elephants stood by to watch. At this point, there were a few references to American insurance companies. But the elephants know to stay back from the fires during food preparation and they get strong (verbal) messages from the mahouts if they start to mess up. Elephants don’t forget. It’s just that they are occasionally tempted. We left the sticky rice to cool and followed the elephants back to the main lodge for a hearty lunch of Thai and Chinese specialties. From the dining room, we could see from the dining area that there was some hanky panky going on near the mud ponds. Our giggling didn’t seem to embarrass them at all. 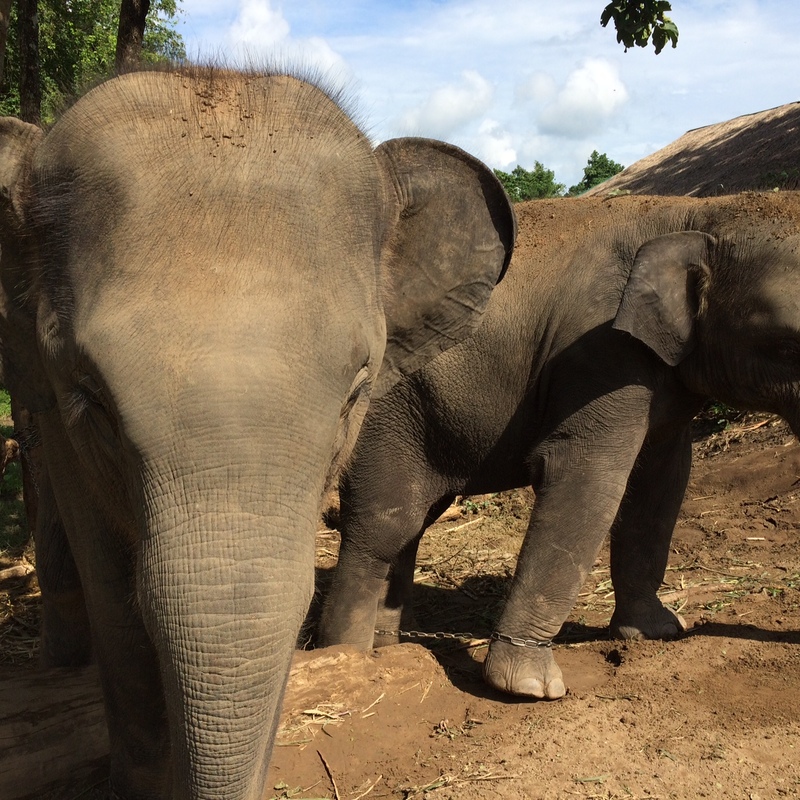 The staff shared stories about how the elephants socialize with each other. The elephants at Elephants World are not family so they do not behave the way they might in the wild. For example, they have ostracized one of the older cows — in the wild they might have been especially protective of her. But they are sentimental even if they are not family. Every year, a group of them spend hours under the tree where the original matriarch died and they remember the anniversary of her death. 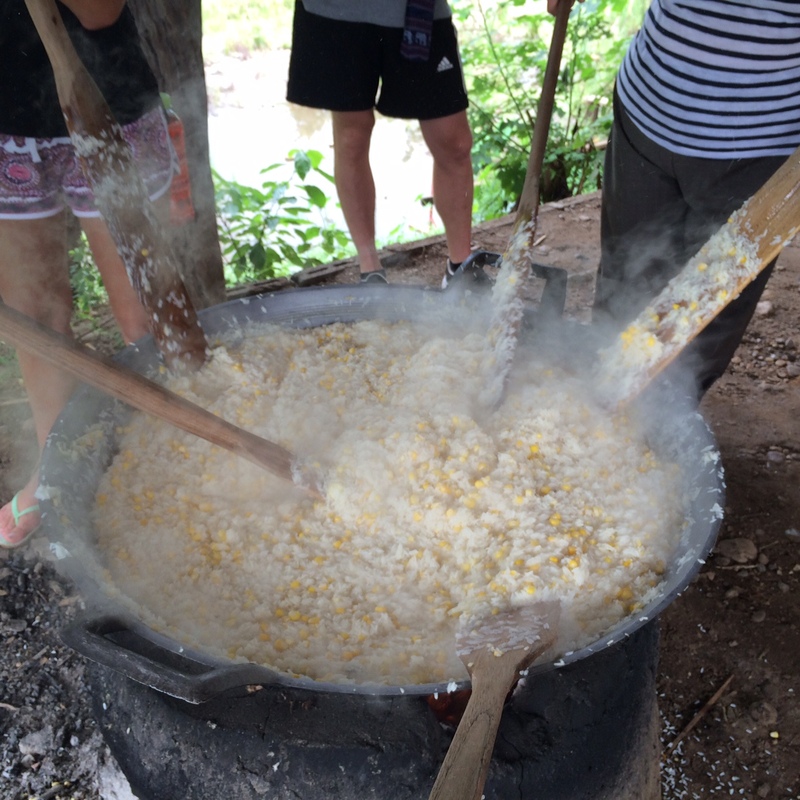 After lunch, we cleaned and prepared about 400 pounds of fruit for the next day’s snack, then walked with the elephants to the river and helped bathe them by removing the mud on their backs with scrub brushes. They seemed to enjoy all of the attention. And when they were done with their baths, they covered themselves in mud again, which protects them from insects and the sun. The highlight of the day for the humans was the afternoon swim. It is not so easy to climb on the neck (not back!) 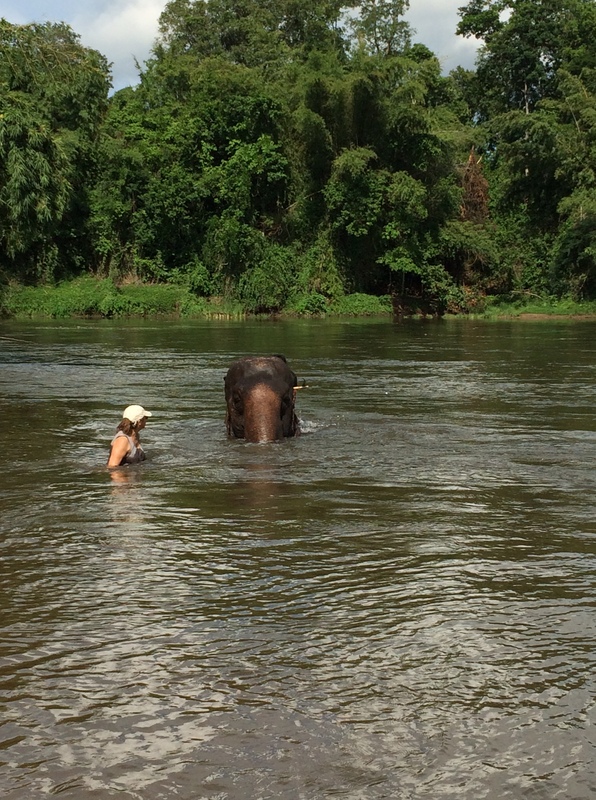 of an elephant in the river current, but I did it. Thailand once had more than 100,000 elephants. Today, it estimates about 4,000 remain, only half of which are in the wild. There is still profit-driven abuse of elephants in Thailand, but Thailand has a number of elephant conservation facilities that are all about promoting animal welfare, and rely on elephant tourism to support their efforts. So if you want to hang with the elephants, just do your homework before you decide where. Oh my. Truly heaven. Lucky lucky u. This would be the absolute highlight of the trip for me. Simply amazing! I love the shots of you in the water with your pals. What an amazing experience, Kim. Loved reading about it. Hope we get to do something similar….get to cool off too 🙂 See you soon. Hi Kim, this is even better than picking olives! I shared it on Facebook. Amazing. They remember the Yahrzeit of elephants they have lost??? What can I say?